It's a mess out there. Obesity, diabetes, heart disease, and inflammatory diseases are all on the rise. And even though it seems everyone has answers, incessant sound bites in the daily news and magazine articles offer little more than superficial, generic advice. Combined with clever marketing intended primarily to sell products, this chaotic and fragmented advice results in a confusing, and typically incorrect, guide to being healthier. How does a person know who's right and what's wrong? How do we separate fact from carefully crafted half-truths? What can we, as individuals, do to be healthier and how can we avoid the most common diseases that plague us today? 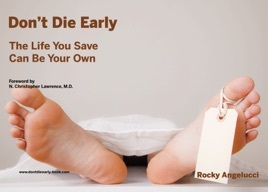 Don't Die Early is a remarkable framework to guide any of us towards a more aggressive approach to our own healthcare. No matter our age or condition, Don't Die Early is a plan of wellness and longevity, written for the everyday person who no longer wants to be at the mercy of their provider but wants to take control and become the healthiest that they can.